In a certain light, Chappaquiddick can be viewed as a pair, even an honorary sequel, to Pablo Larraín's excellent 2016 film Jackie. That film about the assassination of John F. Kennedy and its aftermath, from the perspective of Jackie Kennedy, constituted both a critique and a further act of American mythmaking regarding that most mythologised of 20th century American families. Chappaquiddick on the other hand scrutinises the implications and consequences of such mythmaking. It is an account of the event that on 18 July 1969 ended the life of former Robert Kennedy staffer Mary Jo Kopechne, when a car driven by Senator Ted Kennedy drove off a bridge into a lake on Chappaquiddick Island. Kennedy left the scene of the accident and did not notify authorities for ten hours. The facts of the incident remain contested; at the time Kennedy received a two-month suspended jail sentence after pleading guilty to a charge of leaving the scene of a crash causing personal injury. Despite the tragedy of Kopechne's death and the attendant media scandal, Kennedy of course barely faltered, as he went on to become the fourth-longest continuously serving senator in US history. 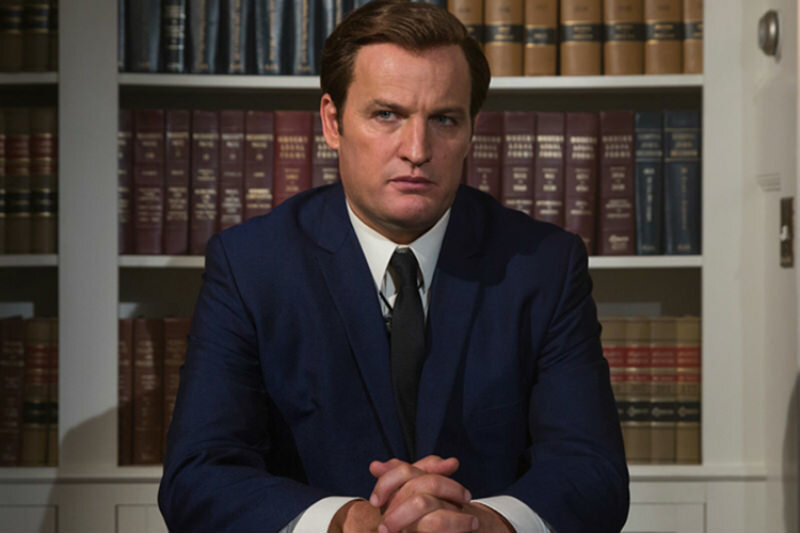 Chappaquiddick weaves established facts, accepted truths and poetic license into a political fable that's both thoughtful and iconoclastic. It sets the incident against the backdrop of the Apollo 11 moon landing, the triumphant realisation of the late JFK's space race posturing. Following Bobby's death the previous year, Ted (Clarke), the last surviving bother, has been left with a hell of a legacy to maintain. As a force in Ted's life these expectations are given personal embodiment in the aging Joseph P. Kennedy Sr (Dern), who is able to wither his youngest son with a mute glare from the seat of his wheelchair. In the aftermath of the accident, Ted's craving for fatherly approval proves a more potent influence than the voice of conscience represented by his cousin and confidante, Joseph Gargan (Helms). The film appreciates the effects of these public and family expectations on Ted's actions, without ever really sympathising with him. 'I'm not going to be president,' he murmurs, by way of announcing Kopechne's death to Gargan. Ultimately, he comes off as more pathetic than Machiavellian, the future Liberal Lion inept in his attempts to spin the situation, and rarely having the courage of his convictions. "We are never allowed to forget just what it is that Ted and the family lawyers are trying to spin; the human collateral to the maintaining of the myth." As such Chappaquiddick amounts to part dark satire, part American nightmare. The final, excruciating moments in the life of Kopechne — one of the highly intelligent, politically astute 'boiler room girls' of Robert Kennedy's campaign — recur vividly. We are never allowed to forget just what it is that Ted and the family lawyers are trying to spin; the human collateral to the maintaining of the myth. Wealth, power, charm all there in abundance in America's 'royal' family. An event that would cripple emotionally for a lifetime had to be 'managed'. That Kennedy continued on as a senator and indeed in any public role saddens more than it appals. The voice of conscience gnaws away at each of us and we can only surmise about the choices made. Is this something to satirise? With his name mud and no chance ever of becoming president, what’s a man with a sense of family destiny to do to preserve a dynasty only recently and thinly established on two deceased brothers but to soldier on, enduring the public eye for the sake of keeping the family name in the public eye, at least as a placeholder until another scion becomes available? Edward Kennedy could have done a John Profumo and retired into a private life of philanthropy until rehabilitated at a later time, but Profumo didn’t have a family legacy to conserve. Kennedy’s duty to the family name was a sort of heroism in a way. As to whether that heroism was a vanity, only an expedition through the dry terrain of his work as legislator and representative to determine whom he helped and how many can disprove. Meanwhile, the Kennedys, none of whom seem to have amounted to anything dynastic, have been eclipsed by achievement-oriented nobodies who came out of nowhere, such as Bill Clinton, Barack Obama, Steve Jobs, Mark Zuckerberg, etc., to migrate into the American firmament. 'It's hard for a guy to cry endlessly and helplessly. It is. Some remote part of you shouts Man, get it together, this is totally beyond the bounds. But I couldn't stop.' Four previously unpublished poems by Portland author Brian Doyle, who died on 27 May last year.